Hi everyone. It is time for a new challenge at AAA Cards. 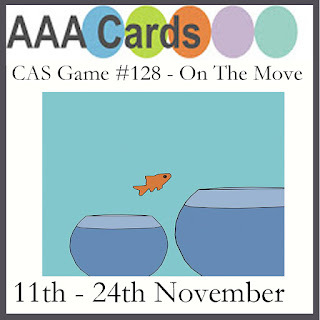 The theme this fortnight is On the Move. For my card, I thought of on the move as movement from the wind. To start, I stamped the three dandelions with versamark except for the one on the right. Then I stamps the single dandelion that has seeds blowing next to the first two. I embossed them with white ep. After the ep was dried, I used a zig clean color marker to color all the nooks in the dandelion and along the stems to give them a shadow. I also used a the zig to draw the faint outline of the ground (hard to see in the picture). Then I stamped the sentiment and added a few clear enamel dots around it. Our sponsor this challenge is Happy Little Stampers. They are giving away a great stamp set to the winner. Like minds eh? 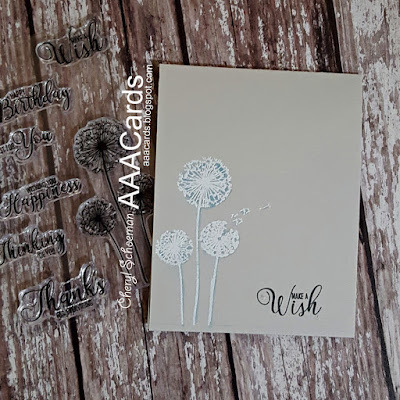 Love the effect of the white embossing, makes the dandelion heads look like they are glistening with dew.